Type 7909 Low Temp Clear PVC Suction Hose is designed for general service suction and transfer hose applications where visible product flow is desired. A specially reformulated PVC blend offers improved cold weather flexibility. Operators can view flow blockages and material flow easily to keep equipment running smoothly. This hose is capable of full vacuum service (at ambient temperature). Use type 7909 Low Temp suction hose for all-season agricultural and pump suction and transfer applications. 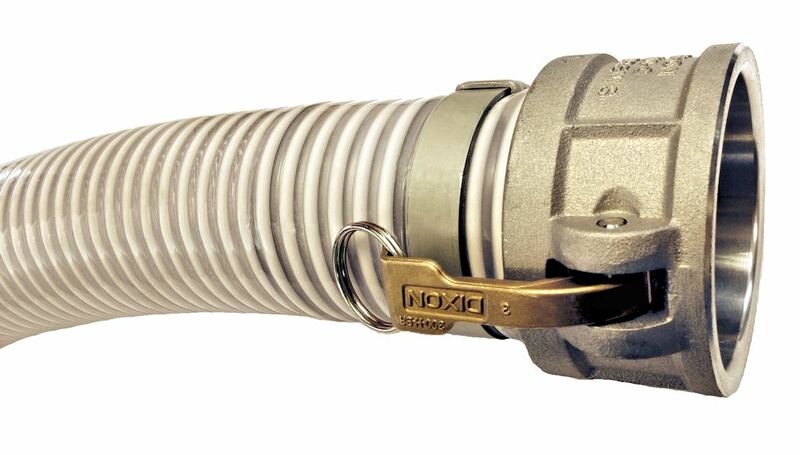 This hose is available in a broad range of standard sizes, and is also available with a corrugated cover for increased flexibility. A clear or blue spiral helix is also available. An FDA grade version is available in (most sizes). Shown with optional cam lock quick connect coupling. Bulk hose and other coupling configurations available.